Winner of the 2014 Silver Independent Publisher Book Award in the relationship category and winner of the Spirituality and Practice Award as one of the best spiritual books of 2013! The search for inner peace is often met with what seems like a conflicting path� the irresistible pull of love and connection with others to which we are drawn. In a conversational tone, Amodeo presents relationship as sacred experience. 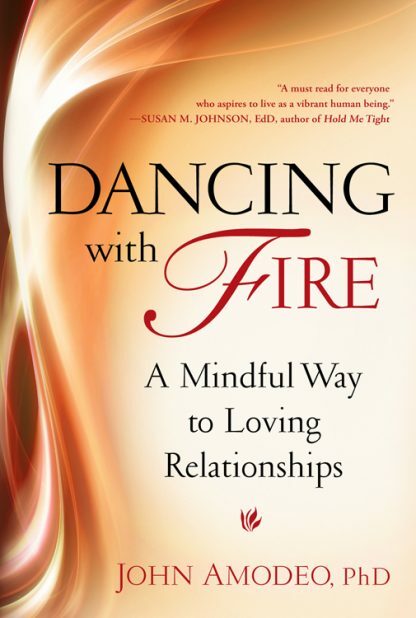 He teaches how to welcome desire mindfully rather than suppress it and how to overcome fear of failure in relating. He also discusses meditation as self-intimacy and holding ourselves with loving-kindness. Lastly, he explores the role of community in spiritual awakening and the issue of whom to trust�our guru or ourselves? John Amodeo, PhD, a licensed marriage and family therapist for over 30 years, has been engaged in Buddhism and spiritual practice for 40 years. He is author of The Authentic Heart and Love and Betrayal, and he was a writer and contributing editor for Yoga Journal. He is also a Focusing Trainer and has trained in Somatic Experiencing for trauma. He lectures internationally on love and relationships, and has been a featured guest on CNN, CNBC, Donahue, and New Dimensions Radio. He has been interviewed or written articles for publications that include the Chicago Tribune, The Dallas Morning News, and The Rocky Mountain News. He lives in the San Francisco Bay Area.